As much as I love winter with it’s snow and ice and woolly hats and numb toes, I have never got into winter sports. D, with the patience of a saint, has tried to teach me to snowboard three times now. 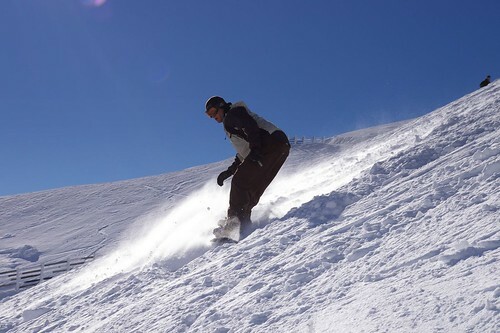 Each time on Cairngorm mountain I thoroughly enjoy the morning of sliding and falling and sliding and falling and falling and falling and OH MY GOODNESS, I’M TURNING! and falling. By lunch time, however, my swollen, blueberry bruised knees make it impossible to fall anymore and I inevitably slink off to the Ptarmigan Restaurant to read my book over a steaming hot chocolate whilst D hits the slopes again. It’s his passion. He loves it. And he’s out in New Zealand indulging in this passion right now (that’s him in the photo), tearing up Treble Cone and every other ski resort in the country with enough snow to satisfy him. Cooking is my passion. When D called yesterday morning from Wanaka he raved about the lines he has boarded in the last week. In turn, I babbled about my ricotta success, the veg in my garden and my bread making adventures. The latter of these may not sound as bold a mission as ski-ing down an off-piste gully in a raging blizzard but, for me, it was the culinary equivalent. As previously mentioned I am not a baker. 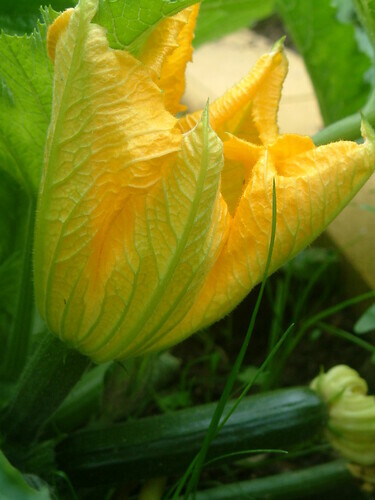 Despite this, when Deb suggested using my courgettes to make zucchini bread (I use the American term as this is something that is not typically made in the UK) I was interested. 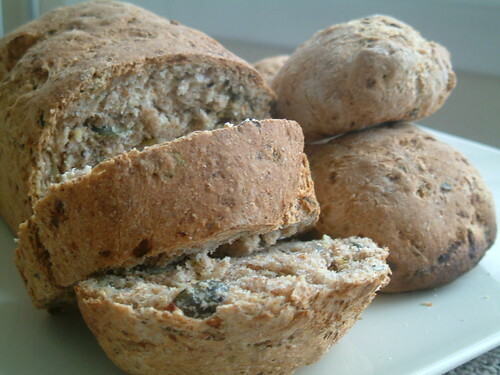 I imagined a deeply savoury loaf to toast and top with strong cheese or a thick slathering of butter. But zucchini bread, I discovered, is sweet. It’s a courgette carrot-cake and, as lovely as this sounds, I wanted something savoury. 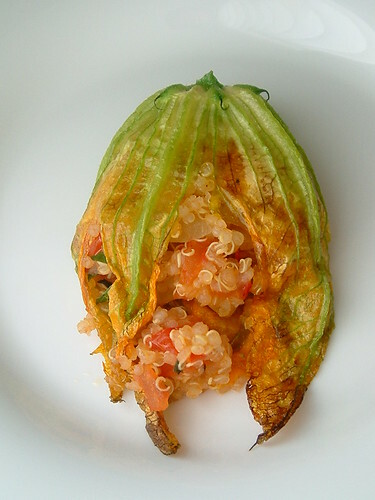 The following recipe is adapted from an Austalian site called Taste. It was my second attempt at making bread (the first was a year ago and I don’t want to talk about it!) and it turned out pretty damned well! Delicious toasted and topped with cheddar. 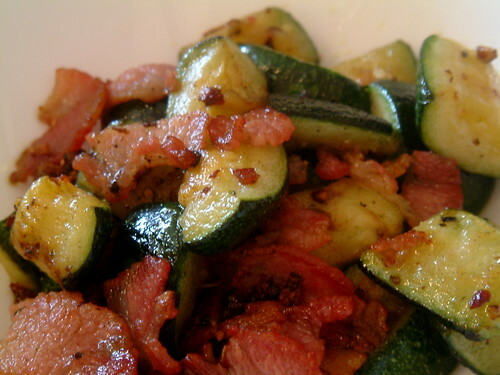 In a colander, salt the grated courgette and leave to drain for an hour. Squeeze out excess moisture using a clean tea towel. Sieve flours, yeast and salt into a large bowl. Add the courgette and pumpkin seeds. 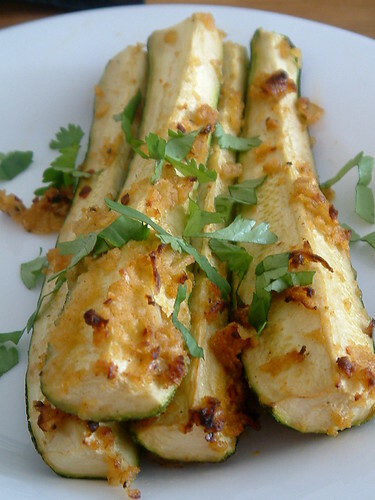 Make a hole in the dried ingredients and add the water and melted butter. Mix well until mixture turns into a dough. Knead dough on a well floured surface for 15 minutes. Split dough into two, shape into balls and place each in a bowl covered with a damp towel. Leave for an hour. Knead risen dough until it reduces to its original size. Shape into a ball, split into smaller balls or place in loaf tin (depending on kind of loaf or rolls you want). Set aside for another 25 mins. Bake at 200oC for 40 mins or until golden brown. 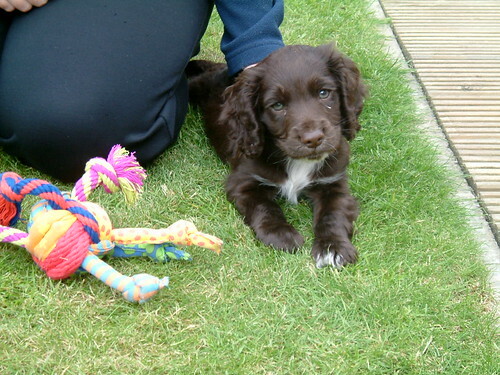 Tammy arrives today. 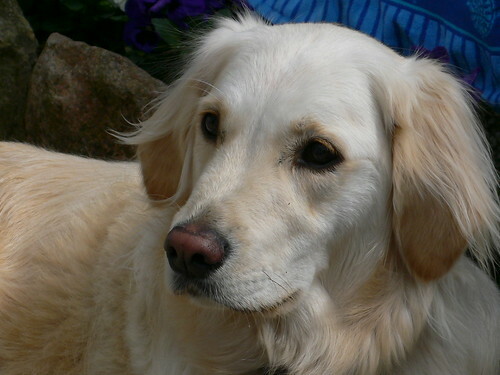 Tammy the Golden Retriever with the most waggy tail in the world and absolutely no spacial awareness whatsoever. Everything tail height (plants, ornaments, lamps…) must be secured or moved before her arrival or risk being swept into oblivion by her excited bum waggling. She’s such a sweetie! Once Tammy, whose travelling companions are my lovely Aunt Val and Uncle Henry, leaves I will be heading down to Aberdeenshire to spend a couple of days with my best friend (Hi Gen!) 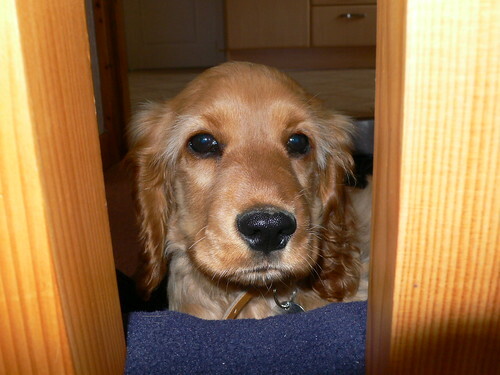 and her adorable Working Cocker Spaniel, Rufus. 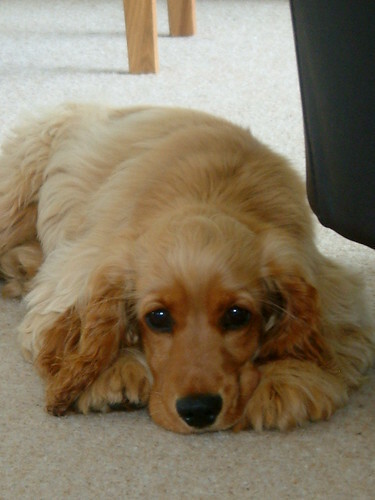 And then, on Tuesday, I’ll be picking up Rosie (my brother’s cocker spaniel) and taking her home with me for A WHOLE WEEK! A WHOLE WEEK! Those of you who know me (or who read my recent meme) will understand just how excited I am about the prospect of 10 days with dogs. To enable myself to make the most of every moment with my first doggy companion I planned our meals for the weekend carefully. Thai green curry (made in advance) on Friday night and a Greek BBQ (very low maintenance) on Saturday night. 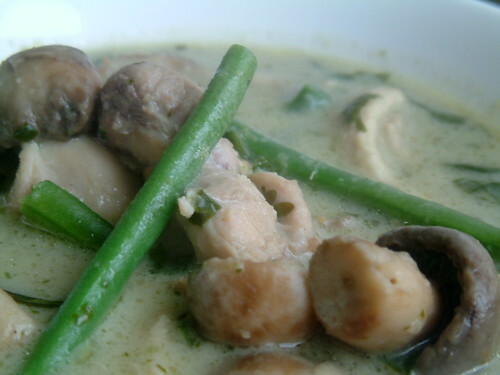 Thai green curry is a dish I have been making for years now; it’s very easy. Only recently though have I begun to make my own curry paste and I don’t think I’ll be going back to shop bought paste anytime soon. 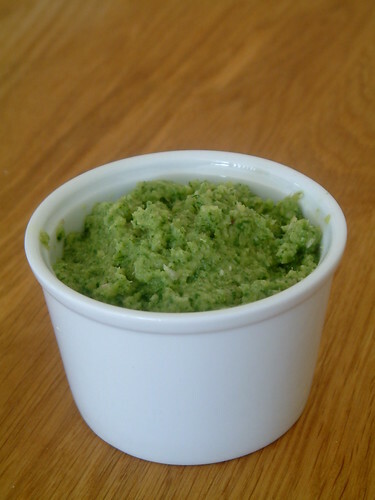 I was always perfectly happy with the Asian food store green curry paste but the homemade stuff has a freshness, a bite that preprepared paste simply cannot have. I ought to say now that I am a chilli wimp. Some heat is good but my tolerance is fairly low. The following paste is seriously potent stuff. My head almost exploded when I foolishly dipped my finger into my homemade green curry paste and tasted it. Wow! It was hot! Painfully so! 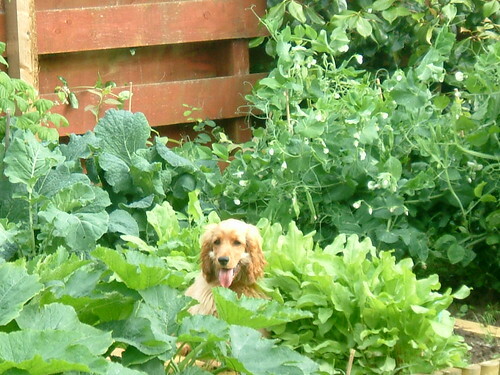 Several minutes were spent running around my house and garden with my tongue hanging out, trying desperately to recover. It was almost as awful as the time I got a chilli seed lodged in my eye. Don’t recommend that either. Though the coconut milk goes a long way to cooling this dish down, add the paste a tablespoon at a time and taste until you find the perfect strength for you. Buy chicken thighs with bones and skin so that once you remove the unwanted parts you can use them and a few veggies to whip up a stock for the dish. The curry paste freezes really well. It goes without saying that this sauce makes a mean prawn or vegetable curry too. 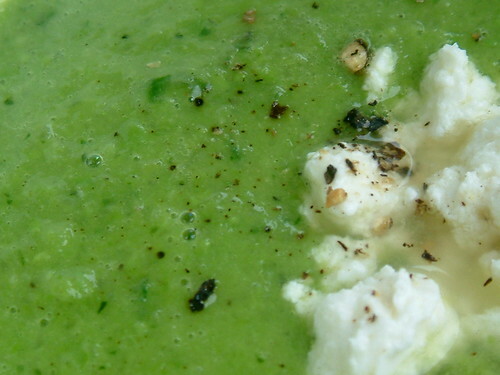 Whizz all the ingredients in a food processor until it forms a speckled green paste. Brown the chicken in the oil and remove with a slotted spoon. Brown the mushrooms in same pan. Add the chicken back into the pan and stir in two heaped tablespoons of the curry paste. Stir to combine. Add the coconut milk, stock, kaffir lime leaves, fish sauce and herbs. Stir well. Bring to the boil, reduce heat and simmer for 15 mins. Taste sauce regularly and add curry paste until the dish is perfectly hot. Add the green beans and simmer for another 7 minutes. Serve with lots of Thai jasmine rice (the easiest and nicest rice to make, I think). 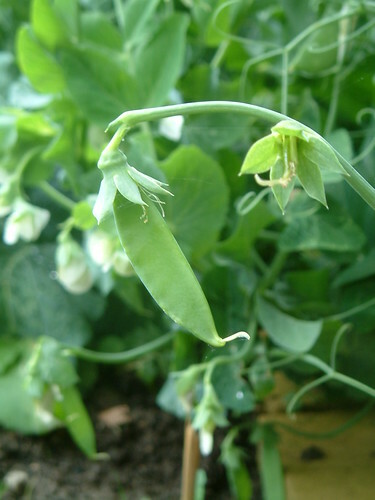 * This is my entry for Weekend Herb Blogging event hosted by the fabulous Susan at Food Blogga. Brianna of Oishii recently posted a salmon recipe inspired by a visit to Greece and it got me thinking of my own visits to the country. My first trip was four years ago. I was living in Finland and had had a pretty hectic spring, not least because I was packing up my life there and moving back home to Scotland. Ahead of me lay another crazy summer working 14 hour days in a residential EFL (English as a Foreign Language) school. I desperately needed to switch off for a while. On a whim, I popped into a travel agent to see what they had on offer and the very next day I was flying across Europe on my way to Santorini. My most vivid memory of the trip was sitting in a small restaurant in Oia. The sun was setting, I had a stray cat on my lap, a craft carafe of wine on my table and a full belly from all the souvlaki I had eaten. It was a moment of perfect tranquility. And then came the invasion. 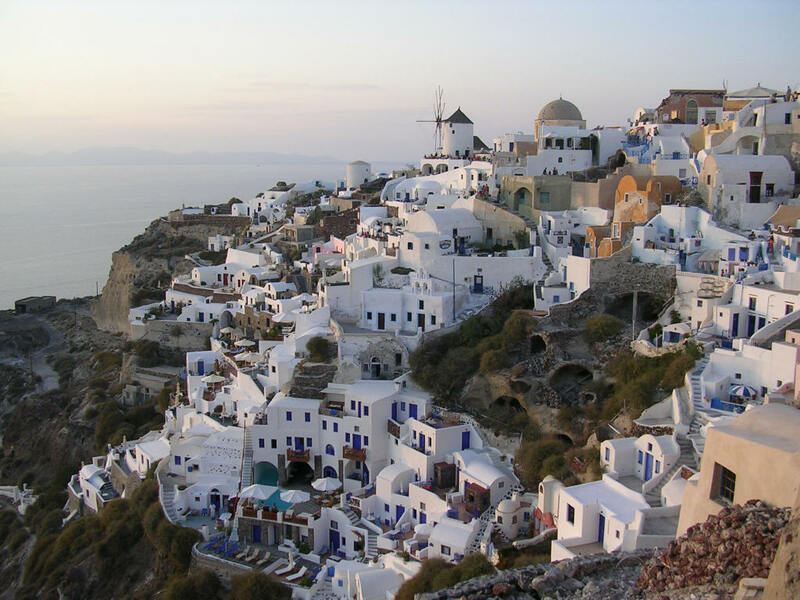 Oia, with its cliff top location and west facing view of the Aegean, is known for its stunning sunsets and the locals seem to come out to watch them like Brits turn on Coronation Street. When an elderly lady motioned towards an empty seat at my table, I nodded. Of course, the old dear could sit with me. Five minutes and fifteen “old dears” later, I was surrounded. Through the Greek gossiping (I could just tell there was some scandal being discussed), the thick clouds of cigarette smoke and the ample, apron adorned bodies of the women I just manage to see the sun sink below a cloudless scarlet horizon. The waiter felt so sorry that my peaceful sunset moment had been spoilt by the gaggle of greek grannies that he waived my bill! It wasn’t really spoilt at all though. It just added to the moment. Inspired by these memories of Santorini, I’m having a Greek BBQ for my aunt and uncle this weekend: souvlaki, greek salad, pita bread and tzatziki. 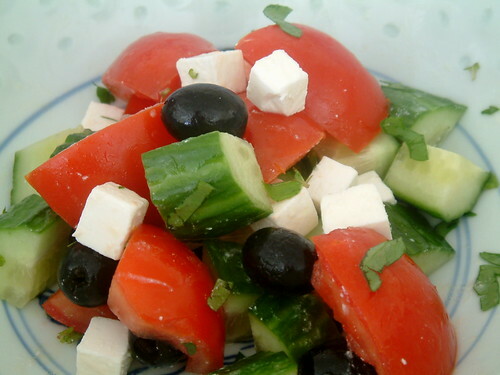 Add all cucumber, tomatoes, feta and olives to a large bowl and combine gently using hands. Mix dressing well and add to bowl. Mix gently. Mix the marinade ingredients well. Add the pork, onion and peppers and stir well to coat. Marinade for at least one hour (preferably overnight). 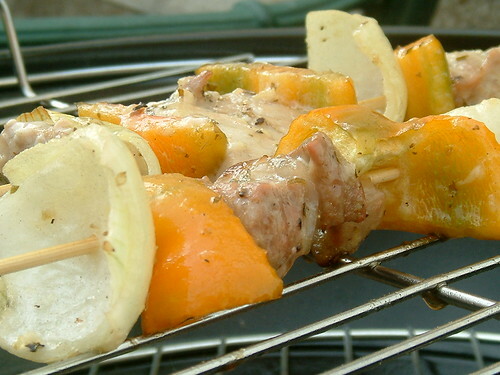 Thread pork, onion and pepper onto skewers and BBQ over a medium heat (ie fairly high up) for 20 mins, turning frequently. These are my entries for the Blog or Bust event at The Clumsy Cook. Will post the tzatziki recipe another time. Felt a little blue arriving home last night. A visit to the garden perked me up though. 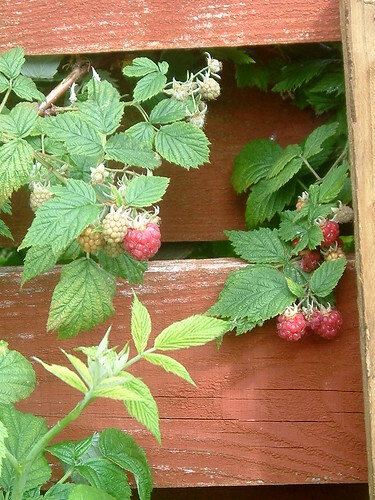 Peeping out from between the fence boards were the first ripe raspberries of summer! Now, I have to admit these particular raspberries technically aren’t mine (I do have raspberry bushes but the fruits will be ready late in the season). 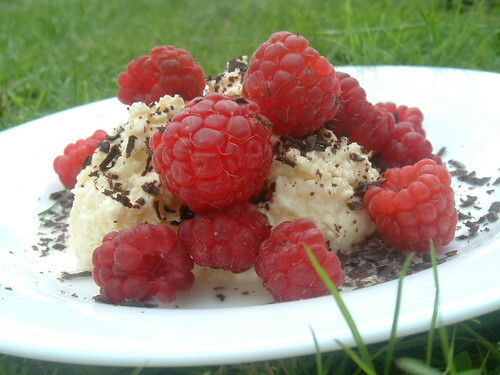 These particular raspberries belong to branches which belong to a bush which belongs to my neighbour. A rather grumpy neighbour too! But the branches have grown into my garden so I feel justified in eating the fruit. AND last year I watched hundreds of beautiful apples on their trees go to waste. Scandalous. Scottish raspberries, I am told, are world renowned. 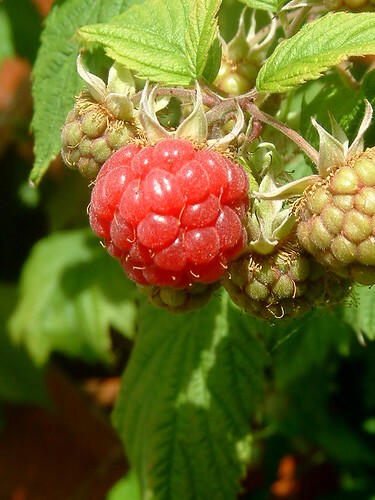 They are amazing – no denial here – but I’m not aware of having tasted raspberries from anywhere else. The Nordic countries have nice berries. Perhaps they could compete? Do we really have the best raspberries? Or are they just some of the best, I wonder. Anyhoo, I digress. 15 raspberries were perfectly ripe last night. I ate five straight away, still warm from the sun. The remaining ten (plus I reckoned a few more might ripen in 24 hours) I wanted to save for the next day. These raspberries were going to be respected! Respected with home-made ricotta cheese. I came across a recipe for making ricotta cheese (recipe here) on Lucy’s wonderful blog Nourish Me a few months ago. Fresh ricotta in 25 minutes, Lucy said. And I had all the ingredients in my fridge! No muslin though…. Not one to be deterred I proceeded to cut up the curtains in the spare room. Voila! Muslin! To this day, and much to my mother’s chagrin, the window dressing in that room is asymetrical. The curtains came in handy again today. Question: do you fellow bloggers tell people you meet about your blog? I don’t. Ever. And I’m not very sure why. I bring this up as last night D and his sister outed me to several people (including the head chef of the renowned Three Chimneys) and my shyness about both blogging and my love of cooking took me by surprise. I blushed. I became vague. I muttered. Why should I be so reticent about something that I enjoy so much? 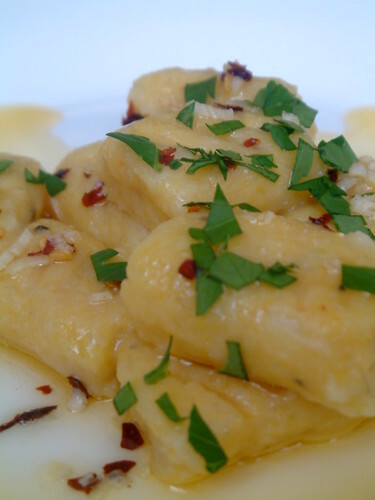 Before I hit the A9 I want to share the following recipe for pumpkin and parmesan gnocchi. It’s my attempt to recreate a dish I ate in Finland several years ago, though that dish was smothered in a velvety blue cheese sauce. Delicious but I found the sauce a little overpowering. No point in making pumpkin gnocchi if you can’t taste the pumpkin. Having had several gnocchi failures in the past, I consulted La Rousse, Simon Hopkinson (who also makes pumpkin gnocchi), Marcella Hazan and Leith’s before embarking on this culinary adventure. It paid off. They were delicious. 🙂 Highly recommended. Place pumpkin in a roasting tin and cover with foil (this prevents the flesh from caramelising). Prick potatoes a couple of times (to let the moisture out) and bake in the oven, with the pumpking, for 1 hour and 15 mins or until potatoes are entirely soft. Remove potato flesh from skins and mash really really well. If you have a potato ricer, use this instead. Remove pumpkin flesh from skin. Place in a clean tea towel and squeeze out as much liquid as possible. Whizz pumpkin and parmesan in a food processor until smooth. Combine pumpkin mixture with potato and dust with flour. Knead. Keep adding flour until mixture forms a pliable dough. Roll into long 2cm wide sausages and cut into 3 cm pieces. Press lightly with a fork (this enables the cooked gnocchi to hold sauce in the grooves). Drop half a dozen or so of the gnocchi into rolling water and stir with a spoon to create a gnocchi whirlpool. Boil gently until the gnocchi start to float. Cook for 30 seconds more then remove from water and drain. Meanwhile melt butter until foaming and add chilli and garlic. Fry gently for 30 seconds. Remove from heat and drizzle over warm gnocchi.